As we begin this week of Thanksgiving I thought we should start out on the right note. Don't worry I have recipes and funny stories from years past to share. But that's not really what Thanksgiving is about. It's a holiday....a season...an idea that is bigger than cooking the perfect turkey. It's about taking the time to stop and look around at all of the things in your life you should be thankful for. If you're reading this it means you have access to the Internet and the ability and leisure to read a blog just because you want to. If you're reading this you're luckier than a large number of people on this planet. You should be thankful. So what should you do with all of this gratitude? Give back! Donate food to your local food bank, serve food at a local shelter, volunteer your time somewhere all year long not just at the holidays. There are so many people in your community who need help in some way. 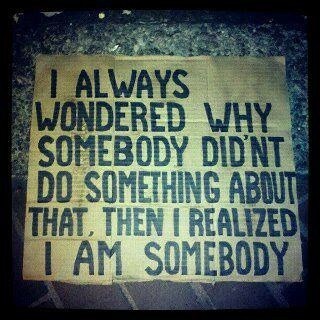 YOU are that somebody who can make a difference and do something about it. What a great resource! Thanks Karen!